We have been exploring for natural gas and condensate in the Greater Poseidon field within the Browse Basin, located offshore approximately 480 kilometres north of Western Australia. 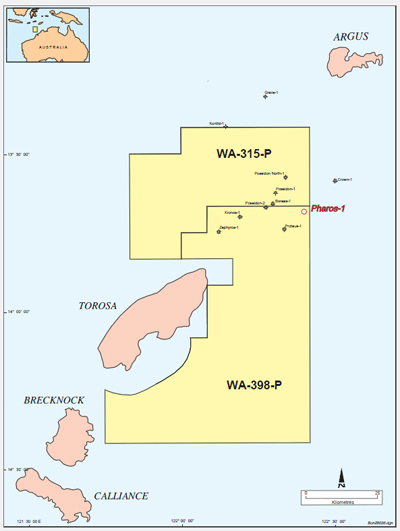 ConocoPhillips operates two Exploration Permits, WA-315-P and WA-398-P, with a 40% interest along with co-venturers Origin Energy (40%) and PetroChina (20%). Phase one of exploration, in 2009/10, involved a four well drilling program of which three, Poseidon-1, Poseidon-2 and Kronos-1 were successful. The second phase of exploration drilling concluded in August of 2014 and consisted of six wells of which five, Boreas-1, Zephyros-1, Proteus-1, Pharos-1 and Poseidon North-1, were discoveries. As part of our ongoing commitment to environmental protection, a marine environmental baseline studies program was undertaken in the Greater Poseidon field and surrounds. In addition to informing engineering studies, these studies have helped enhance the overall scientific fabric of the Browse Basin region. ConocoPhillips is continuing to assess all technical information gained through the exploration and appraisal activities and engineering studies conducted to date.